The Richeys from BG: Fall is here! Well, it has been a few days blogger friends. Drew and I have been a little busy this week. Mostly we have been doing a bunch of running. Crazy, I know. I'm really not a runner but we decided that we would both do the Medical Center 5K. Actually, I'm doing the 5 and Drewby is doing the 10. Oh, I have to show you guys the cute little gift I bought for Scoot today! It is so cute and was my first experience with Etsy! 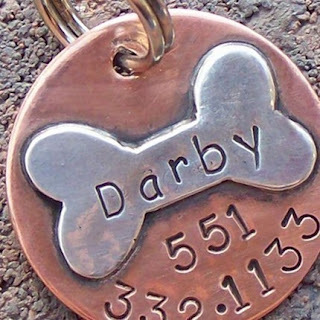 I am a huge fan... Of course when I get it, it will have her name and my number, even though Darby is a great name for a dog! I was on Etsy looking at Derby hats. I am definitely wanting to go to the Derby this year considering that I have never been. What Kentucky Horse Girl has never been to the Derby??? Definitely, a problem. Oh well, I hope y'all have a great weekend!